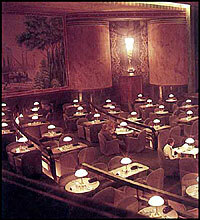 Why The Commodore Dinner Theater is Our Favorite Date Spot! Take my Commodore Dinner Theater Behind-the-Scenes Tour to learn all the theater's secrets! The truth? 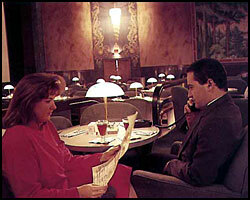 This is our all-time favorite date place...anywhere! Why? See, you don't just go to The Commodore for a movie...you go for the experience. From the moment you walk in the doors of this vibrant cinema cafe, you feel like you've walked into another time. A time when Grace Kelly and Audrey Hepburn ruled the fashion and movie world, when women wore hats and gloves for an evening on the town. Somehow, you feel more...elegant...just being there. But I digress...The Commodore Dinner Theater is the ultimate cinema cafe offering first-run movies on a 41 foot screen with Dolby Digital sound and tempting food. No, it's not a 5-star menu...more like delicious comfort food--salads, pizza, sandwiches, and yummy desserts. The theater is really spectacular inside! We recommend the cheese, tomato, and pineapple sandwich (really yummy!) and an order of beer-battered onion rings if you're giving your diet a rest for the night. Make sure to save room for the cinnamon loaf or their other calorie-laden but delicious desserts. Big enough for 2-3 people to share, the cinnamon loaf is like a huge Cinnabon, dripping with raisings and icing. Our other favorites include their Snicker "Big Blitz" pie, and their Heath Bar Cheesecake (I did say it was "comfort" food!). Part of the fun is that you order your food by picking up your very own private phone on your marble-topped table. Then they bring it to your seat before and during the first 30 minutes of the movie. Cushy chairs complete your eating and viewing experience. If you prefer, or if you're just coming for the movie, you can move upstairs to the balcony to watch the movie (the balcony is open Friday through Sunday). They sell popcorn, soda, and candy upstairs. As if that's not enough, the food prices are very reasonable (sandwiches are generally $6-$8 each), and the movie tickets are only $8 each ($6 for seniors and $7.00 kids 8-13). You can get a discount of $1 per ticket if you pay cash. So we recently decided to add the theater to our "Cheap Family Vacation" Hall of Fame. That's our coveted list of free or inexpensive things to do on a cheap weekend getaway. Here are more places that make this special "Cheap Family Vacation" list. NEW: Take my behind-the-scenes tour to the hidden story of this amazing theater. Enjoy a great meal before your movie! 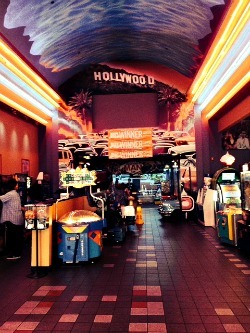 Kids under 8 are not admitted to the theater...a blessing for couples and adults wanting to enjoy their movie in peace. Located in historic Old Town Portsmouth, The Commodore Dinner Theater is on the National Register of Historic Places and the Virginia Landmarks Register. So go, go, go! You may even see us there. We'll be the couple holding hands! TIP! The Commodore doesn't take credit cards (except in the dining area) or sell tickets by phone, so you have to buy movie tickets at the box office (or use Commodore gift certificates, which can be purchased at the box office). If you go on the weekends, get there one hour before the movie. You'll be able to go right in and relax, or get a bite to eat. Stop by earlier in the day to buy tickets, then return for the movie that evening. Looking for more ways to save on entertainment? Or more inexpensive things to do on a date? Check out our "Discount Travel/Entertainment" page. 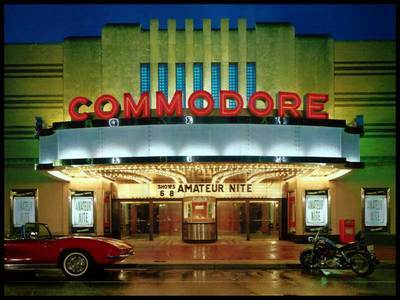 Commodore address: 421 High Street, Portsmouth, VA. Commodore Dinner Theater phone number: 757-393-6962. Commodore Dinner Theater 24 hour theater & show information: (757) 393-6962. Here's a link to a Google Map for the theater. We finally got around to trying out one of the four area Cinema Cafe locations. These are converted modern movie theaters where they show movies while you dine...kind of a cheap version of the Commodore. So how did Cinema Cafe compare to the Commodore? Click here for our full review of Cinema Cafe...and learn how to see first-run movies there for only $1!